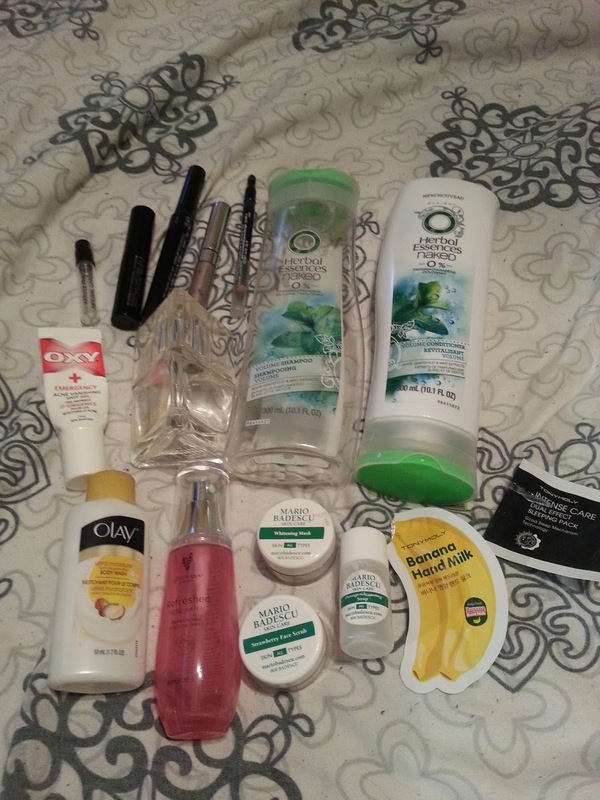 I surprisingly got through quite a bit of products for July! That makes me super excited! I can't wait to get through some more in August! Not everything is pictured above, so I will just add in those random empties as I go through the products! I try and avoid volumizing shampoos and conditioners because my hair is already so thick. 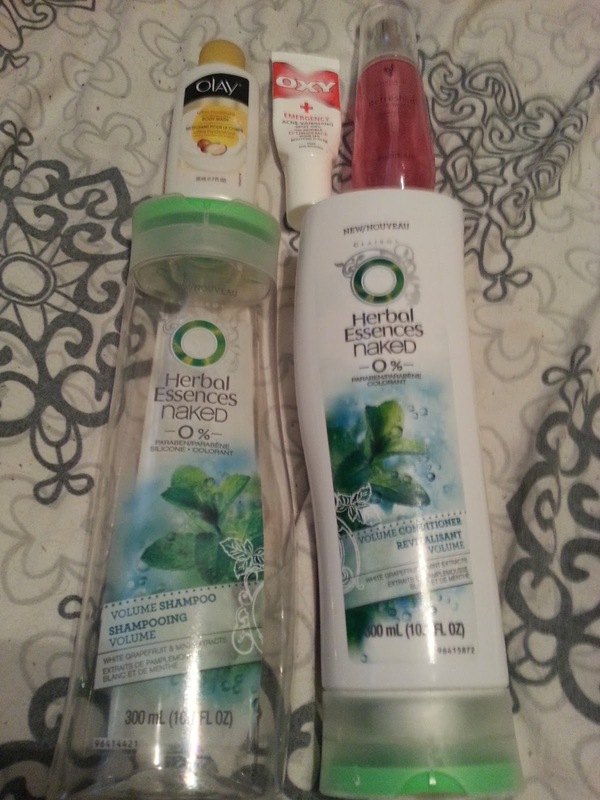 I liked this set when I got it from BzzAgent but I noticed that it makes my scalp really itchy after a day or two. I still have the moisture set that I purchased probably last year. But I wouldn't repurchase these again in the future, it irritates my scalp too much. This is obviously just sample size, but I got a few good uses out of it. The texture is nice and creamy, I didn't find it ultra moisturizing, and the scent was okay. I may repurchase this if it was on sale for a good price. But I have a few other body washes to get through first. I picked up 3 of these last year on clearance for like $5 a piece, they were regularly something like $20 each. Anyway, I find these are good for spot treatments on the occasional pimple. They don't zap it away in one night, but I find 2 or 3 nights help it get on its way. I wouldn't repurchase these at regular price, but I definitely would if they were on clearance for a cheap price again. I REALLY liked this rose water. The smell was a little off putting because it was pretty floral, but once it dries you can no longer smell it. I think this has helped very much with my dry skin, and I've been using it as a toner and sometimes a mist after I apply makeup. However, I don't like the size and I definitely don't like the price. I ended up purchasing a larger spray bottle from Lush cosmetics (review to come eventually)... so while I wouldn't repurchase Younique's rose water, I definitely will continue purchasing rose water in general. I'm not sure if I got this as a sample from Sephora or if it came in my Shoppers Drug Mart Mascara gift sample box. Anyway, I liked this one. It made my lashes look really long, and separated them nicely. It wasn't very volumizing/thickening but it was a nice consistency. It wasn't too wet. I would consider purchasing it in the future - but my all time favourite still stands as Buxom Lash Mascara. I received this for free to review, probably about a year ago. I kind of liked it at first. 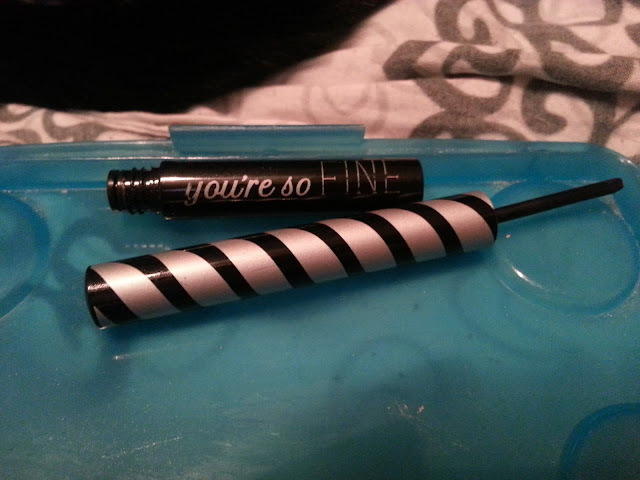 I recently pulled it out because my other liquid liner ran out. I have to say this gave me HUGE issues this time around. I constantly had to keep twisting the bottom to get any product out. 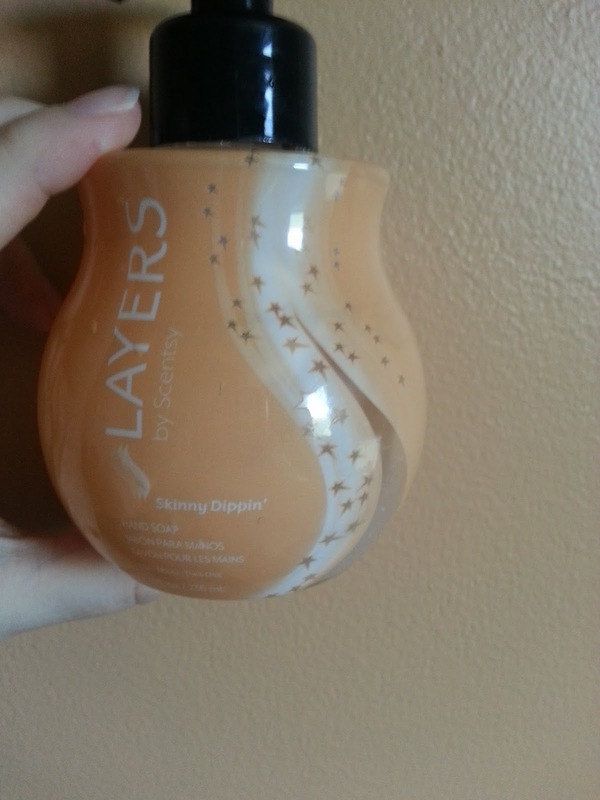 Then when it came out it dried pretty much instantly on the tip, so it was a little difficult to apply. Then I would put it away and take it out the next day and there was a ton of gel sticking out of the top. I was wasting more than I could use. Anyway, I feel like it dried out a little too much and I just wasn't happy using it, so I decided to toss it. There probably wasn't much left inside considering it would just empty itself. I wouldn't repurchase this. I don't remember the full name, or shade of this, so cream shadow it is. I've had this for years and probably should have tossed it before trying it. But I tried it, and it was dried out. So into the garbage it went. It was a nice shade. I probably wouldn't repurchase though because I have enough eyeshadow to last me quite a few lifetimes. I believe this was in a dark gray colour. I used to LOVE this liner. However I recently found it again, sharpened it, and it's just SO dry. I've been having a hard time falling back in love with pencil liners, so I decided to toss it. I've grown to love liquid liners so much, and I can't see myself going back to pencil liners. I just can't get close enough to my lash line, and they just look so faded compared to that awesome dark black you get from a liquid. 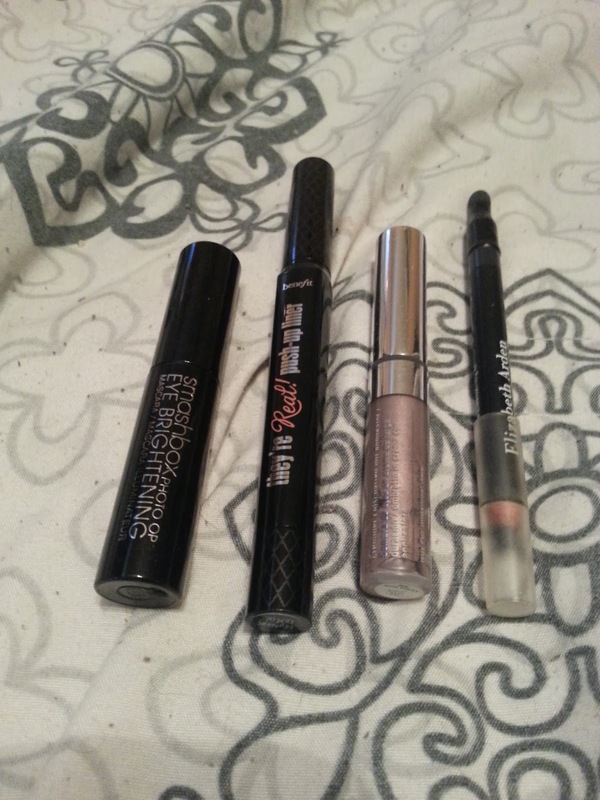 I wouldn't repurchase this liner. The scent of this is GREAT! I loved it so much I actually ordered a Banana Sleeping Pack. I hope it smells just as awesome. This wasn't the greatest hand cream, BUT I'm generally not a fan of hand cream to begin with. This was a little more on the runny side. Would I purchase the hand cream? No. But I've placed an order for the sleeping pack. Plus, I just love banana anything. I had never tried a sleeping pack. It seems to just be a super awesome night cream. I've read online that some people use them as a day cream as well. I have a few samples of these. I wouldn't purchase this now, but we'll see how it compares to the banana sleep pack. This dried up before I even got a chance to try it. So into the garbage it went. I probably wouldn't purchase it though because they are expensive. This was like whipped strawberry souffle lol. There were actual strawberry seeds in the scrub. As a scrub, it sucked. 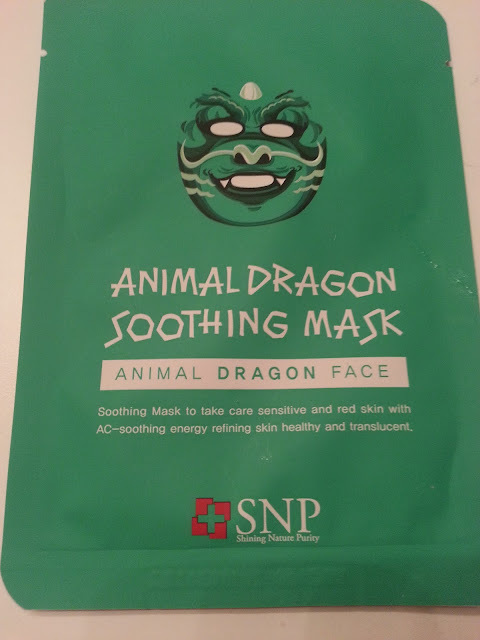 I found when I would put it on, the seeds would just stick to my hands and only the "souffle" part would go on my face, so I was getting no exfoliation. I wouldn't purchase this. They recommended this for dry skin. People with dry skin know you shouldn't use soap on your face because it dries it out further. Why they recommended this, I don't know. I wouldn't purchase it because I have other cleansers I like better, and it would probably be very expensive. I got this from birchbox. I'm not really a fan of floral perfumes. I wouldn't repurchase this, but it smelled okay once it was applied. This is actually quite a few years old.. and I'm not even sure how I would describe the scent. This is actually from Scotland as well. If I received it again it would be okay, but I wouldn't repurchase this just because I prefer sweeter scents. I got this in a past Ipsy bag. I remember people were furious that there was glitter in it. I didn't find it to be very glittery at all once it was applied. Anyway, I used this until it was pretty much all empty. One day I applied it to one eye, stuck it back in to get more for the next eye, and it SNAPPED! I wasn't too impressed, and that's why this photo exists. I probably wouldn't repurchase this just because I have another favourite brand, but this did the job and I liked how dark the black colour was. I thought I loved this. And it was easy to take off makeup, especially in the eye area. However, I HATED the pump, and I definitely hated how it leaked everywhere. I was wiping my counter every day because the oil would leak out on it's own. I wouldn't repurchase this just because of that problem. I emailed them and complained and they sent me a coupon for a free product. I ended up using it on night cream, that I also ended up hating. I used this up, and I now have the Banila Co Clean It Zero Balm. 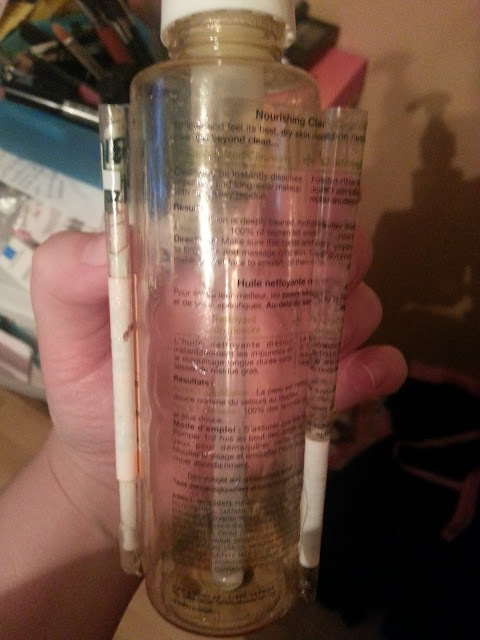 I wouldn't repurchase this Garnier Oil Cleanser. I only bought this because it was recommended to me by a Clinique rep a few years ago. 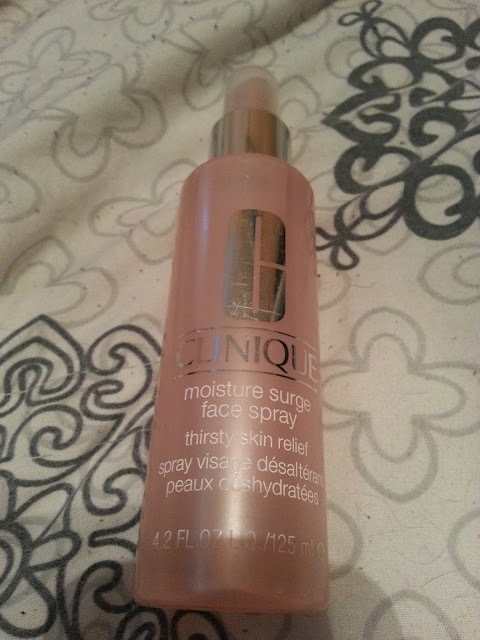 It works nicely for added moisture before applying moisturizer, or even as a setting spray after applying makeup. I finally used it all up, and I just added water to it. I probably wouldn't repurchase it though just because I'm really enjoying the rose water instead. But this is an awesome product for those with dry skin! I loved the smell of this, it's somewhat melon and tropical. Anyway, I got this for free with host rewards, so that's awesome. 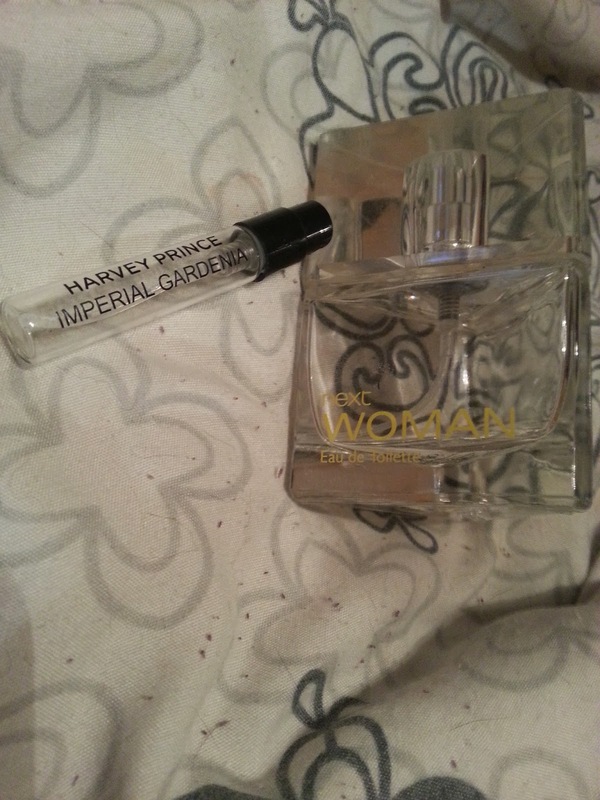 I picked up a few more in different scents, so I can't wait to use them. These are being discontinued at the end of the month, so if you're interested in trying them, click my Scentsy link above! I already have repurchased some, and I would purchase more. Hopefully they last a little while in the closeout section so I can stock up on a few more scents before they are gone for good! This made my skin look so smooth and refreshed. 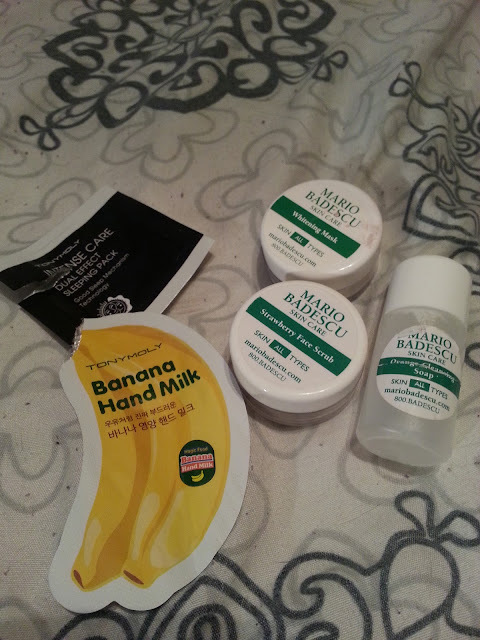 I would probably repurchase this one, but I definitely loved the rice mask the most! 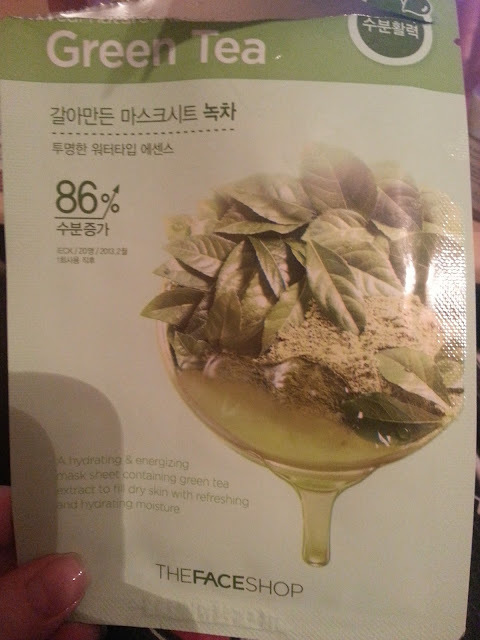 I have some more sheet masks to get through, but I'm really loving them. I'm so glad to have stumbled on others blogs who use them, because without seeing reviews, I probably would have never tried them! This was the cutest mask ever! It actually is printed as a panda! This says it is to restore dull and rough skin with brightening energy delivering luminosity and softness. My face was so soft after using this! It did make my skin look less dull. I really liked this one! This was in the pattern of a dragon, also super cute, but the panda was cuter! This says it is a soothing mask to take care sensitive and red skin with AC - soothing energy refining skin healthy and translucent. 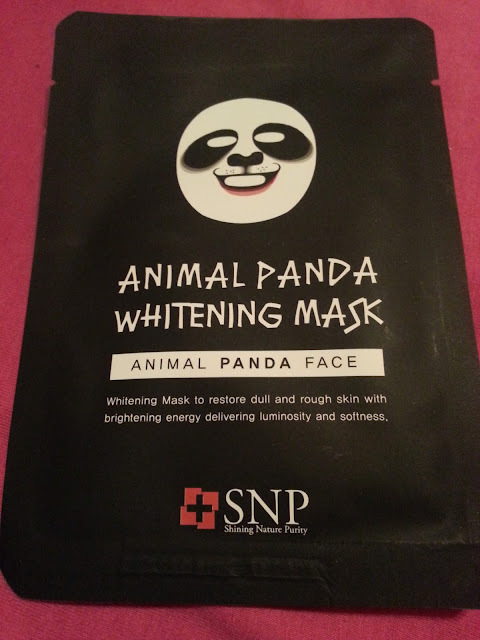 This did help a little with the redness, but I found the panda mask to be a little more effective. I still loved it though and I would definitely purchase a set of these animal masks! So awesome to have won it from MaskGenie, I will probably sign up for a monthly subscription once our dollar gets a little better. If that ever happens lol.